Average Height	: 16" - 18"
Average Weight	: 20 - 32 lbs. The Icelandic sheepdog is a breed of dog of spitz type originating from the dogs brought to Iceland by the Vikings. 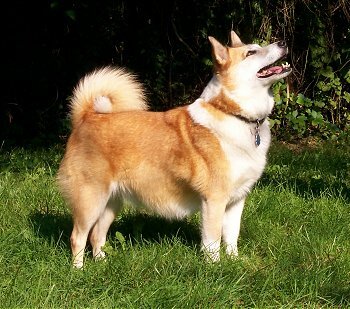 It is of similar type to the Norwegian Buhund and to the ancestor of the modern Shetland sheepdog and Welsh corgi. They are still commonly used to herd sheep in the Icelandic countryside. The Icelandic sheepdog very much resembles dogs found in graves in Denmark and Sweden from about 8000 B.C. Dog imports to Iceland were limited and from 1901 even forbidden. In 1650 Sir Thomas Brown wrote "To England there are sometimes exported from Iceland ... a type of dog resembling a fox ... Shepherds in England are eager to acquire them!" Plague and canine distemper destroyed over 75% of the breed in the late 19th century, leading to a ban on the importation of dogs to Iceland. The purebred Icelandic sheepdog was again bordering extinction in the late 20th century and in 1969 the Icelandic Dog Breeder Association (HRFÍ) was established to preserve the breed, among other aims. The Icelandic sheepdog gained AKC recognition in June 2010, alongside the Leonberger and the Cane Corso. As the name implies, it is a sheep dog, but is also used as a watch dog and general working dog. When herding, the Icelandic sheepdogs were not mainly used to take the sheep from one point to another, but to prevent animals from straying. Additionally, the dogs were in charge of herding horses and other animals as well. When herding failed, the dogs drove the animals by barking. Thus, they tend to bark when they want something, although this behavior can be controlled by training. In the Icelandic landscape, sheep often get lost and it has historically been the dog's job to find them and return them to the herd. They are therefore used to working on their own and to figuring things out for themselves, so owners have to beware lest they learn things they should not. As a watch dog, their main task was to alert the inhabitants when somebody was coming, so these dogs tend to bark a lot when they see people approaching. The Icelandic sheepdog is very loyal and wants to be around its family constantly. It follows its owner everywhere. Unlike most working dogs, these calm down when indoors and will happily lie down at their master's feet. Icelandic sheepdogs are tough and energetic. Hardy and agile, they are extremely useful for herding and driving livestock or finding lost sheep. However, the dogs are not known for hunting. Icelandic sheepdogs are very alert and will always give visitors an enthusiastic welcome, without being aggressive. Friendly and cheerful, the Icelandic sheepdog is inquisitive, playful and unafraid. They generally get along well with children, as well as other pets.